It’s Perfect Picture Book Friday again! Brief Synopsis: Tess is not exhibiting proper library behavior, so her mother puts her in time out. 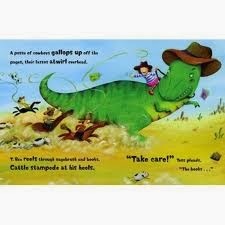 But while she’s there, a T. Rex escapes from a book and runs amok. Will Tess be able to get him under control? Links To Resources: Curriculum Connections (classroom activities); T. Rex Classroom Activities; Dinosaur Coloring Pages If you were a T. Rex, what would you do if you got out of your book? What other characters can you imagine escaping from a book? What would they do? Read Library Lion by Michelle Knudsen. How are the stories alike and how are they different? How does T. Rex’s behavior compare to Lion’s? Now. Because I am behind in catching up from my little internet vacation, I’ve got nothing else to say today. And PPBF bloggers, please leave your post-specific links in the list below. Have a great weekend, everyone. I’ll see you Monday if I have anything interesting to share :), otherwise Wednesday for Would You Read It! Boggles the mind lol. This sounds fab like Night of the Museum. Have a lovely weekend! This reminds me of the classic Danny and the Dinosaur. That was really fun too. Happy New Year, Susanna, and welcome back! What a fun book. It always amazes me to see the creative ideas out there, even though there is “nothing new under the sun.” Good to be back in the groove with PPBFs! Oh I just love this book! I am running to the library to check it out. Sound so cute and adventurous for both the character and author. Can you imagine? The spread you shared is my hook! I love that she's riding the T. Rex like a cowgirl. Happy New Year! I can just imagine a T-Rex racing around the library. Hijinks and hilarity abound! Sounds like a romping good book! I love stories that reflect information to a child. It's good to be back in the #PPBF routine…hope your holiday and brief time off were rejuvenating and fun. I know I shouldn't be wishing away the days…but I'm excited for February and Making Picture Book Magic! Here's to my library list exploding again! I'll add T Rex today! Have fun settling back into the internet. I kept my eyes open just long enough to try and post the first extra title, but not long enough to comment on yours, Susanna! 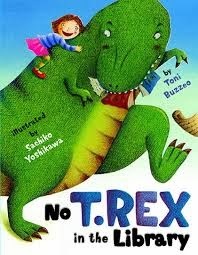 Thanks for opening the PPBF house for us again, and for sharing this title – I am not a super dino fan, but I love the sound of 'T Rex'! This sounds absolutely charming. I just ordered it up. Thanks for telling me about it. Your book choice sounds absolutely delightful! Wish this one had been around when mine were little 😉 It looks like a lot of fun! Ooh! You have it with Spanish? I haven't seen that. How do you say T. Rex in Spanish? A dinosaur and a library, a winning combo, I reckon! I'm not a big dinosaur fan, but I do live in the Dinosaur Capital of Texas. Those illustrations are pretty cute and the story line sounds cute enough. I guess I'd better check this one out! thanks! Happy new year, Susanna! Looks like you've showcased another winner. Must get this one for our school library! Back to PPBF!!! Yippee! I hated to miss reviewing this time but had unexpected visit from my husband's parents. And heaven forbid that I prepare a post ahead of time just in case something like this comes up!!! I'm a procrastinator deluxe! But…I can't wait to check out the other reviews and to read about Tess and T. Rex! Sounds adorable!